April 22, 2019 Assistant Professor of Sociology and Garrett Fellow Alissa Cordner, who specializes in environmental health and risk management, talked about the public safety concerns associated with a group of fluorinated pollutants known as PFAS, common but little-understood chemicals used in water-resistant clothing, stain-resistant furniture, nonstick cookware and many other consumer products. Cordner is one of the organizers of a nationwide PFAS contamination list. April 21, 2019 Raymond and Elsie DeBurgh Chair of Social Sciences and Professor of Sociology Michelle Janning explained the importance of personal space for children living in blended families, whether that means a room, a shelf, a chest, a desk or a drawer of their own. She noted, "The amount of stuff or the size of the space one controls doesn’t matter so much as the feeling that you have control over your things." April 20, 2019 Professor of Politics Aaron Bobrow-Strain spoke to NPR Weekend Edition host Scott Simon about his new book, The Death and Life of Aida Hernandez, which chronicles one undocumented woman's journey through the U.S. immigration system. April 18, 2019 Lukas Koester graduates from Whitman in May 2019. 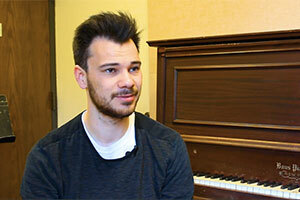 From trombone playing to working in the student engagement center, Lukas has learned a lot during his four years at Whitman, a place he knew he could call home the first time he visited. 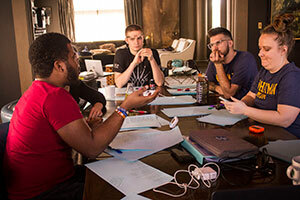 April 18, 2019 At Whitman College, students are learning the critical role that well-honed arguments and careful listening play in the art of debate. 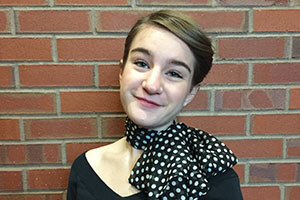 Led by Lauran Schaefer, director of Debate and Forensics, and Baker Weilert, assistant director, the Whitman Debate Team is training students not just to argue, but also to listen. April 17, 2019 This spring, the Fouts Center for the Visual Arts is the site of a new arts program bringing bilingual first-graders from Edison Elementary School in Walla Walla to Whitman’s campus. April 16, 2019 Debi (Aucutt) Toews '76 journey to Whitman College began in a hair salon. That's where her mother ran into another mom whose daughter was a sophomore at Whitman. Her mom loved the idea of the small class sizes. For Toews, she loved the friendly approach of then-director of admissions William Tingley, whom she met at a college fair shortly thereafter. April 16, 2019 Kate (Pringle) VanDonge ’11 met her future husband in the History of Ancient Greece. But it wasn’t the battle of Troy or the birth of philosophy that ignited young love. It was the wardrobe of a guest lecturer. 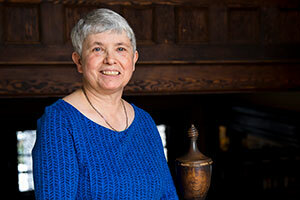 April 16, 2019 Nancy Tavelli and Keith Farrington came to Whitman College in 1977. 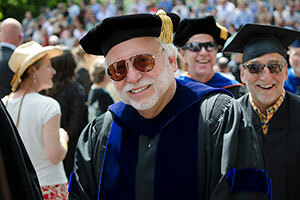 Farrington took a faculty position in the Department of Sociology. Tavelli was a resident director in “new dorm” — now William O. Douglas Hall. 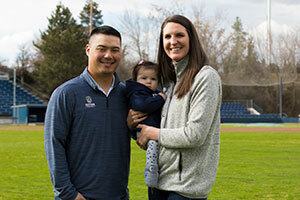 April 16, 2019 Opportunities that strengthen the experience for Whitman’s scholar-athletes come because of the generosity of donors. Experiences like when the team got to play at what was then Safeco Field in Seattle. Or when Kitamura saved up to purchase a new pitching machine. Or this year, when the team was able to travel to Tucson, Arizona, and play in the Kino Sports Complex, a former MBL spring training facility. 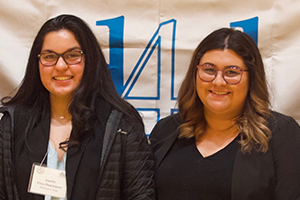 April 15, 2019 First-year Whitties Salma Anguiano ’22 and Ameliz Price-Dominguez ’22 tied for first place in the national Letters to an Elected Official Competition, presented by Project Pericles. April 15, 2019 Carl E. Peterson Endowed Chair of Sciences and Emeritus Professor of Biology Paul Yancey described the "exciting" new genetic mapping of the hadal snailfish, the first animal from the extreme depths of the ocean to have its genome sequenced. It may reveal clues as to how such organisms survive in hostile environments like the Mariana Trench, the deepest place in the ocean. April 15, 2019 Assistant Professor of Sociology Álvaro Santana-Acuña, an expert on world heritage sites, reflects on the symbolic and material damage of the fire at France's Notre Dame cathedral (link in Spanish). April 14, 2019 In Professor of Politics Aaron Bobrow-Strain's new book, The Death and Life of Aida Hernandez (Farrar, Straus and Giroux, 2019), he explores the boundaries of empathy and justice and reveals the human cost of militarizing the U.S.-Mexico border. April 10, 2019 Whitman College graduates have been joining the Peace Corps since it was founded in 1961. More than 330 Whitties have joined the agency that works across the globe to create sustainable solutions to a multitude of issues. There are nine Whitman alumni serving in countries around the world — and this summer, new graduates will join their ranks. April 10, 2019 To the south and east of Walla Walla are the Blue Mountains, a long anticlinal ridge composed of basalt flows. Unlike the Wallowa Mountains in Oregon, the Blue Mountains are not tall enough to have been glaciated. 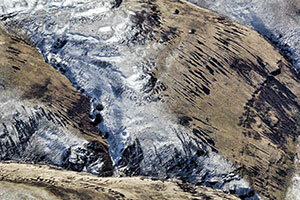 They consist of upland plateaus cut by deep V-shaped canyons. 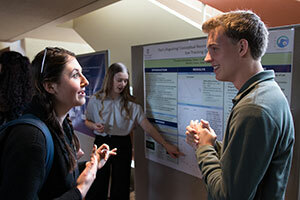 April 8, 2019 Whitman College’s annual Undergraduate Conference is bringing a variety of student-led and produced research to the Whitman community on Tuesday, April 9, 2019. In its 21st year, the conference has grown to a record 69 students presenting 57 posters in Cordiner Hall, three unique sessions of panels and music performances by the Chamber Ensemble, and Jazz Ensembles I and II. 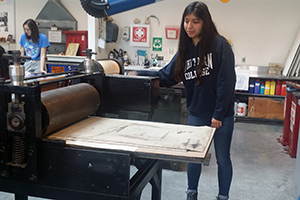 March 28, 2019 People interested in exploring the history of Whitman College from a student’s perspective have a new avenue for research: This spring, the archivist at the Penrose Library finished a yearlong effort to digitize archives of the Whitman Pioneer and Whitman Wire newspapers. March 28, 2019 Assistant Professor of Sociology Álvaro Santana-Acuña writes that just as the announcement that Netflix will turn One Hundred Years of Solitude into a series has reverberated throughout the world, the global distribution of the streaming giant may give new life to the stories of Macondo and the Buendía family. 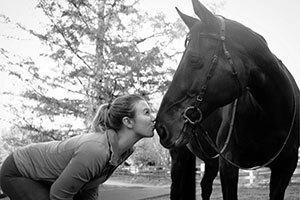 March 27, 2019 Whitman College senior Caroline Evan “Cello” Lockwood ’19 will spend the year after graduation studying the ways that different cultures interact with horses, thanks to a $30,000 grant from the Thomas J. Watson Foundation.